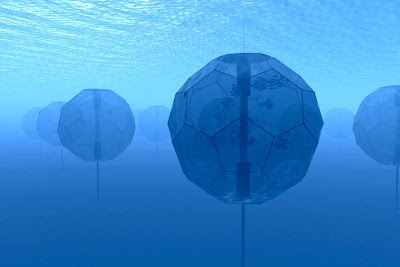 A lawsuit filed today in Hawaii’s Federal District Court challenges a fishing gear permit issued to Kona Blue Water Farm by the National Marine Fisheries Service for its open ocean aquaculture “aquapods.” Hawaii Independent. Two environmental organizations have sued the federal government to block a permit issued to a Big Island company aiming to grow amberjack, or Hawaiian yellowtail, at a farm in federal waters off the Big Island. Associated Press. New Hawaii political maps unveiled Wednesday create competitions among incumbents in three state House districts, preserve each island's representation in the state Legislature and move the urban Honolulu congressional district to the west. Associated Press. Six state representatives would find themselves in House districts with another incumbent under a proposed redistricting plan that redraws the state's political boundaries to represent changes in the isles' population over the past decade. Star-Advertiser. The non-partisan Institute for Truth in Accounting has identified Hawaii as a "Sinkhole" state because it is one of five states in the worst financial position in the country. Hawaii Reporter. Governor Neil Abercrombie addressed the nearly one thousand attendees at the Hawai’i Conservation Conference today. Hawaii Public Radio. How do other states deal with members of task forces lobbying legislators on task force matters? Civil Beat. Despite tight finances, the state Department of Education was able to lengthen the school day at dozens of campuses, exceeding the requirement of a new instructional-hours law for this school year. Star-Advertiser. A series of legal stumbling blocks have Hawaii State Board of Education members rethinking a tax designed to help construct new schools. Civil Beat. Prosecutors in the Aloun Farms forced labor trial lost another bid Wednesday to delay the proceedings, then took testimony from a key witness who implicated defendant Alec Sou in a scheme to underpay imported Thai workers and to collect $2,500 in kickbacks for every laborer he hired. Hawaii Reporter. Lava flooded out of the base of the western flank of Pu'u 'O'o on Wednesday afternoon, sending a broad flood of pahoehoe downhill and into virgin forest. Tribune-Herald. One of Hawaii's two refineries isn't producing gas right now and will not be for days.Hawaii News Now. After a year and a half of work, the Maui Visitors Bureau has to come up with one word that reflects the character of each island. Garden Island. After weeks of back-and-forth finger-pointing, the Honolulu City Council might be ready to give Mayor Peter Carlisle the money he asked for to build new sewage infrastructure. Civil Beat. Honolulu City Council member Ikaika Anderson said he will submit a letter to Mayor Peter Carlisle today, asking him to approve funding for an alternative method for treating sewage sludge so the city can avoid trucking raw sewage sludge from the Sand Island treatment plant. Star-Advertiser. The Honolulu City Council’s Budget Committee held an informational briefing Wednesday about the administration’s plan to place police initiated tows under a single contract. KHON2. Hawaii County taxpayers are on the hook for $117,000 in legal fees stemming from a failed condemnation action for the Hokulia bypass road. West Hawaii Today. The American Civil Liberties Union is asking five law enforcement agencies in Hawaii what procedures they use to track citizens using cell phone location data, part of a nationwide campaign targeting police, sheriffs and other law agencies across the country. KITV4. The ACLU has formally asked the Hawaii Police Department to disclose whether police have ever used citizens' cell phone location data without a warrant. Tribune-Herald. Kaua‘i Island Utility Cooperative starts capital patronage refunds. Garden Island. HiBeam, a Hawaii nonprofit created to help launch and build promising early-stage Hawaii technology companies, is focusing on bridging the gap between businesses here and global markets in Asia. Pacific Business News. The Nature Conservancy has received a $1.1 million grant to protect Hawaii forests from invasive weeds. Associated Press. The sudden, early Wednesday morning removal of Pine Tree Inn is being received with mixed emotions depending on who you ask in the community. Garden Island. Hawaii's bottom fishing season begins September 1. KITV4.